With Replay Video Capture for Mac, you can capture streaming videos from any site or even create your own video screencasts. 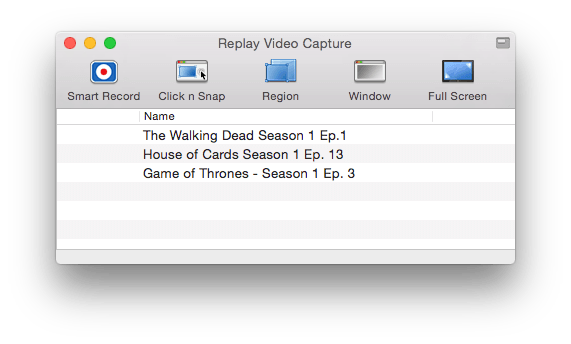 Using Replay Video Capture for Mac is as easy as playing a video and clicking Smart Record button . Replay Video Capture for Mac will then find the video playing on your screen, setup borders, and begin the recording. Audio is recorded through SoundFlower, which is installed alongside Replay Video Capture. Soundflower allows Replay Video Capture to record directly from the system audio rather than the speakers, so you can record perfect quality audio along with your video. 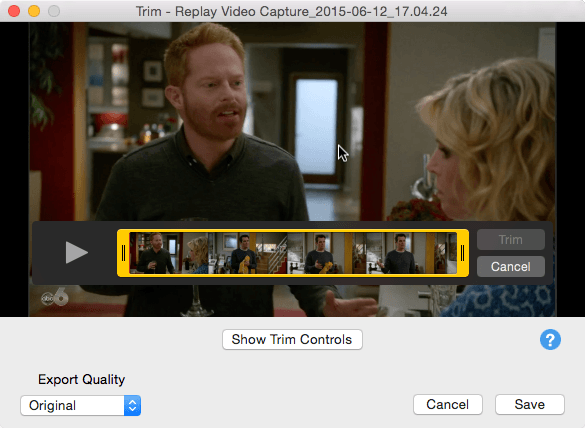 Replay Video Capture for Mac is an easy, yet powerful way to capture video from your Desktop or web browser. Since Replay Video Capture is a screen recorder, you don't need to worry about the source of the media - anything within the recording boundaries will be recorded. These files can be transferred to smartphones or tablets, burned to a CD or DVD disc, or incorporated into other programs like Keynote or video editors. Smart Record auto-detects the video window and records automatically. Automatically detects the video playing on your screen and snaps to the capture area to the videos boundaries. You can adjust these boundaries if necessary by clicking the unlock button. Automatically starts recording and stops when the video stops. The Click n Snap method is similar to Smart Record, but uses manual recording rather than automatic. Easily adjust the capture boundaries if necessary. Click the record button to start recording. Drag the capture canvas around to define the capture region. Adjust the boundaries as necessary. Sets the capture canvas to the full screen. Record button: Click this to start recording manually. To stop recording, choose the stop recording button from the top menu bar or from the small interface that appears while recording. Cancel button: Click this to cancel setting up your canvas and return to the main interface without recording. Loupe Zoom button: Use this to accurately position the capture canvas for pixel-perfect recordings. This tool also includes a grid option. Toggle it on for grid-line guides. Lock/Unlock button: Unlock this to re-size the canvas using the small white arrows at the top, bottom, and corners. Timed: Set it and forget it. Enable this option and set the number of seconds that you'd like your recording to be. It will stop at that set time. Delay Start: Enable this option and set the number of seconds you'd like to delay the start of your recording. Audio: Select the audio device that you'd like Replay Video Capture to use when capturing. In most cases you'll want to choose Soundflower. Soundflower allows Replay Video Capture to record directly from the system audio rather than the speakers, so you can record perfect quality audio along with your video. Learn more about setting up Soundflower for Replay Video Capture below. You can also select to record from your microphone. This is super-handy for screencasts and demos. Canvas sizing handles: Drag these to match the area of the window you'd like Replay Video Capture to record. For pixel-perfect sizing, use the handy Loupe Zoom tool referenced in #3 above. 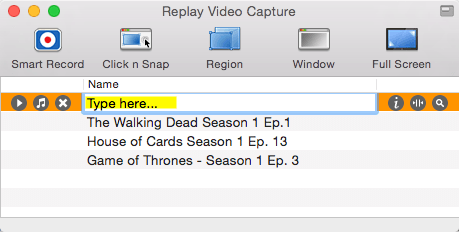 By default, Replay Video Capture names your recordings with the date and time. If you'd like to change this to something more meaningful, simply click in the Name field of the recording title you'd like to change. A blue box will appear around it. Type your new name there. Note: If you would like to view the file in Finder and rename it there, simply right-click on the track in your list and select Show in Finder. Hover over a recording and click the icon. This will reveal the file in Finder. Hover over a recording and click the icon. Hover over a recording and click the icon. This will reveal the file in Finder. Drag the file to your trash. From here you can preview and trim your recordings. the trim controls should appear automatically, but if they don't, click the Show Trim Controls to display them. To trim your recording, click and drag the yellow handles at each end of the timeline to set your in and out points. When you trim your recording, only the trimmed section (between the yellow handles) will be saved. 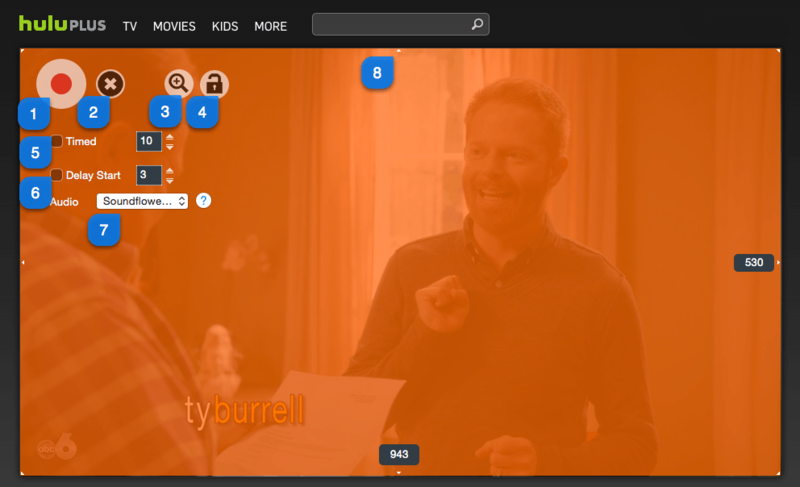 Click Save to create a new video from your trimmed section. Show Mouse Cursor in video: By default Replay Video Capture does not capture your mouse cursor. But there may be occasions where you would want the cursor recorded. Comes in handy for screen demos. Switch this on to record the cursor. Hide main window while recording: This hides the main window so that it stays out of your way while recording. You can use the controls in the menu bar to stop recording. Auto open recorded videos in Quicktime; If enabled, your finished recordings will open in Quicktime immediately after stopping. Recording Destination: Click the Change button to update the default location where Replay Video Capture will save your recorded files. Select audio device when recording: Select the audio device that you'd like Replay Video Capture to use when capturing. In most cases you'll want to choose Soundflower. Soundflower allows Replay Video Capture to record directly from the system audio rather than the speakers, so you can record perfect quality audio along with your video. 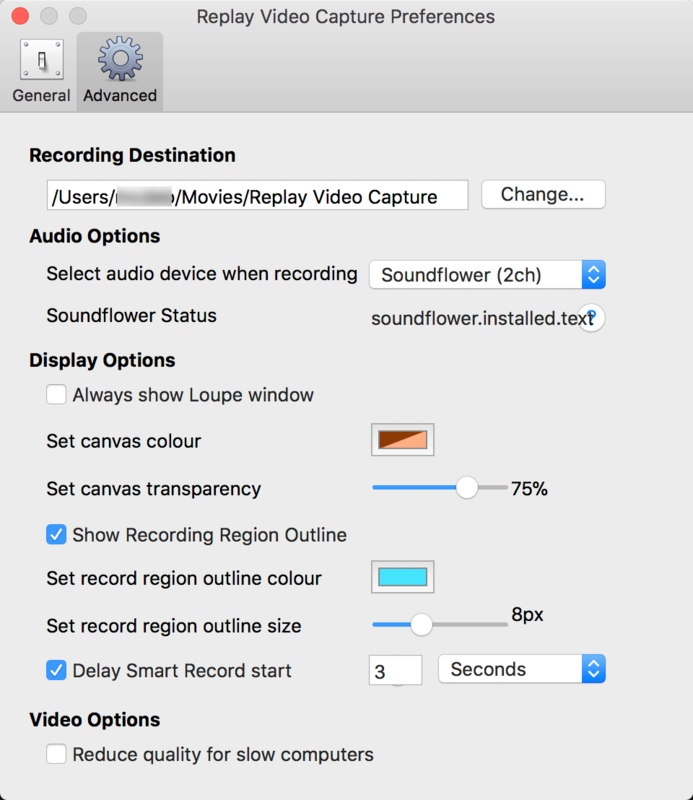 Learn more about setting up Soundflower for Replay Video Capture below. You can also select to record from your microphone. This is super-handy for screencasts and demos. Set canvas color: Change the color of the transparent canvas to whatever you like. We picked orange, but you might like something different. Set canvas transparency: The default value is 75% but you can change it here. Show recording region outline: This is an easy way to recognize the region that is recording. You can switch the outline off, change its color or width here. Delay Smart Record start: You can set a delay here by entering the number of seconds you'd like Replay Video Capture to wait after clicking the start button before it actually starts capturing. Reduce quality for slow computers: Got a relic? Ease up on the required processing power by enabling this option. Audio is recorded through SoundFlower, which is installed alongside Replay Video Capture. Soundflower allows Replay Video Capture to record directly from the system audio rather than the speakers, so you can record perfect quality audio along with your video.